Early morning drive south from Athens to the Corinth Canal, which connects Aegean Sea with the Ionian Seas (short stop). 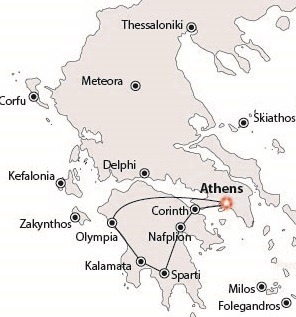 Drive on and visit the Theatre of Epidaurus, Nemeia Winery and fascinating Mycenae. Arrive at Nafplio to explore Palamidi Fortress and the city’s beautiful old alleyways. Overnight in Nafplio/Tolo area. Breakfast at the hotel. Departure towards the south part of Peloponnese. Visit of the Archaeological site of Mystras. Overnight in Sparta area – the land of King Leonidas and his legendary soldiers. Enjoy a relaxing stroll along the costline, passing by Mystra, Gythion and explore the historic churches of Kalamata Overnight in Kalamata. Depart for Olympia through the steep hills and wild scenery of the Central Peloponnese and pass by the towns of Tripolis, Megalopolis and Andritsena. Continue to Olympia and visit the archaeological site and museum. Overnight in Olympia, the cradle of the Olympic Games. Drive back to Athens through the steep hills and wild scenery of Peloponnese. Overnight in Athens. Delivery of the car at the Airport Athens and departure.